Check out the special deals and combination kits. There are lots of options. My book is now more than 15% off. Look at the basic starter kit if you want a budget friendly option to get you started on a new project. If you are ready to jump all in, check out the Deluxe Starter Kit and go wild. In any case, I hope you find inspiration for new creative adventures. Be sure to share your work with others, and with me. I love to see what my students produce. 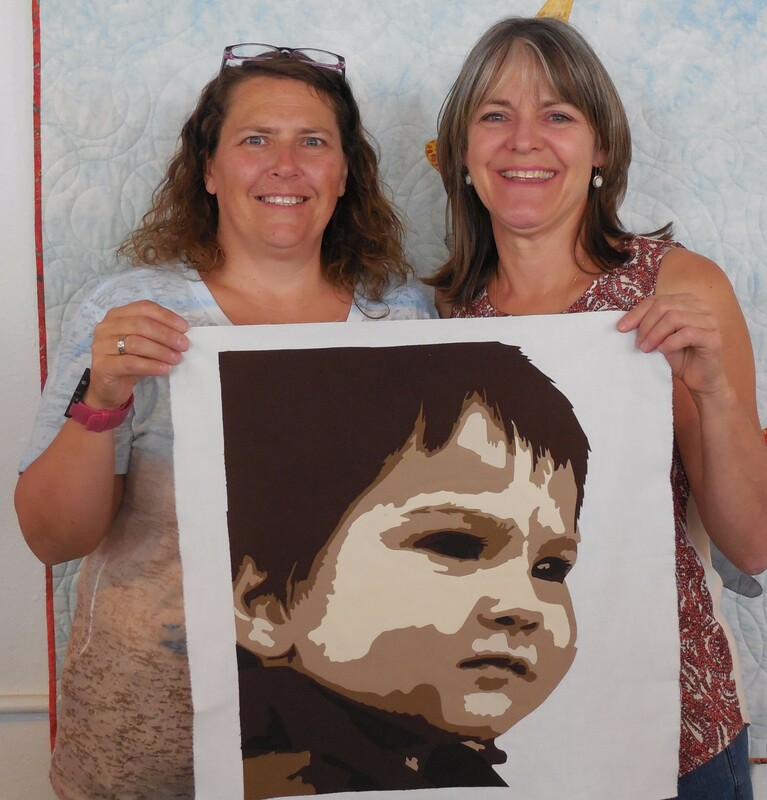 In Thread-Painted Portraits, you’ll find: Step-by-step instructions for choosing a photo, building a background, stitching faces and finishing your piece; Expert advice on selecting the perfect fabrics and thread; A gallery of inspiring artwork; and Instructions for artistic binding techniques that go beyond ordinary. Includes book, fabric kit, and thread kit. I provide the inspiration and instruction, and you provide the energy and enthusiasm. 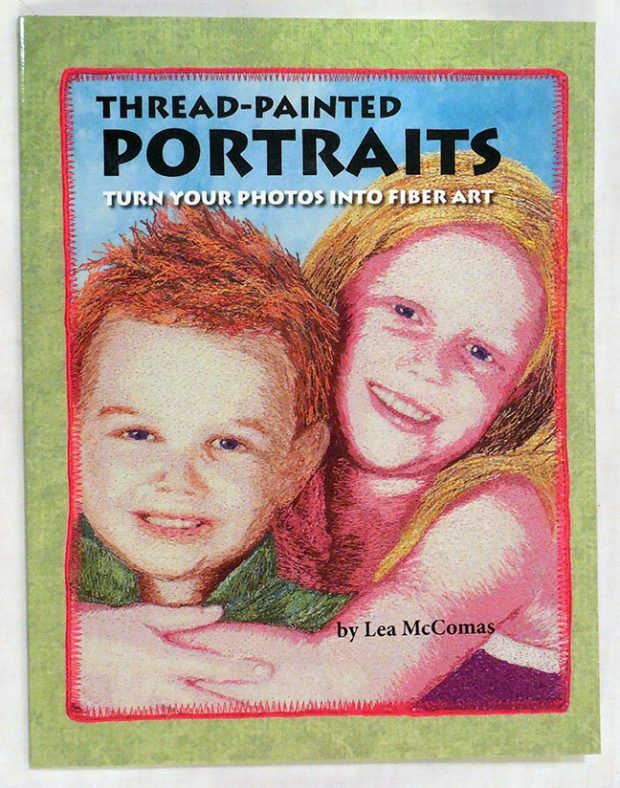 Purchase the book with fabric and thread so that you can get started on your own project right away. When ordering, look for a memo to seller box on the Paypal website. Indicate color preference in this memo box. Your options include: beige (shown), brown, peach, pink, or gray. If purchased separately, these items would cost $50. 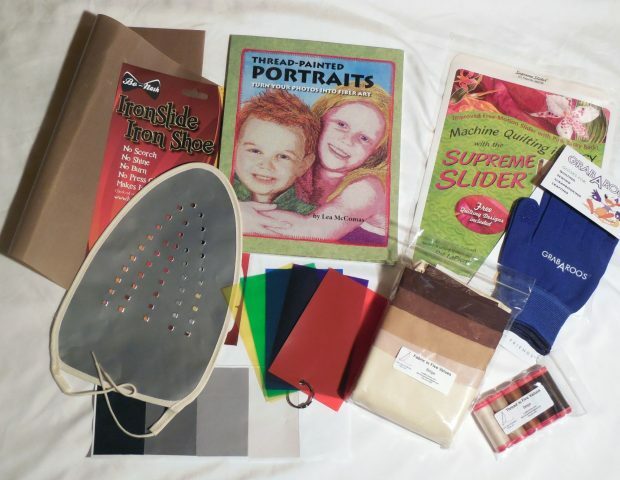 Includes book, fabric kit, thread kit, fusing mat, iron shoe, and Value Finding Tool Kit. If your focus in on fused applique pictorial quilt, this kit will get you started. You provide the fusible and the photo, and you are on your way. Follow my applique instructions in chapters 2 & 3. Move on to Thread-painting when you’re ready for a new challenge. When ordering, look for a memo to seller box on the Paypal website. Indicate fabric and thread color preference in this memo box. Your options include: beige (shown), brown, peach, pink, or gray. If purchased separately, these items would cost $90. 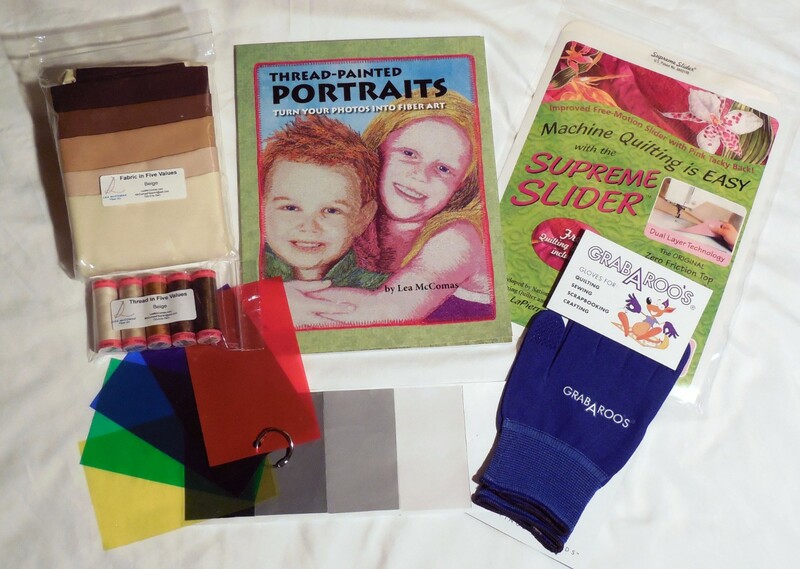 Includes book, fabric kit, thread kit, Supreme Slider, GrabARoo’s gloves, and Value Finding Tool Kit. 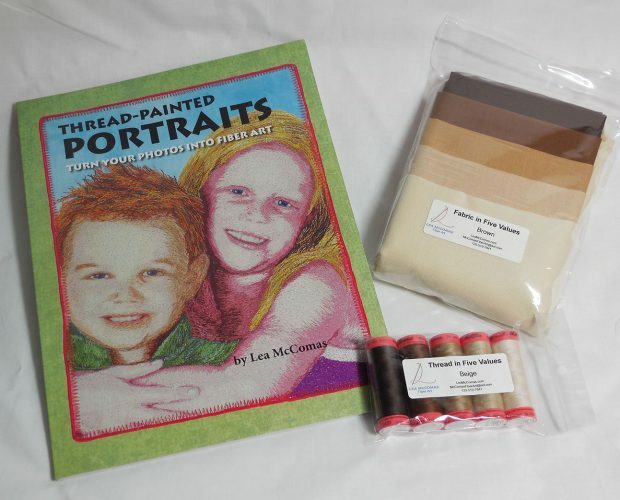 If your focus in on thread-painting portraits, this kit will get you started. You provide the pictorial foundation, and you are on your way. When ordering, look for a memo to seller box on the Paypal website. Indicate fabric and thread color preference. Your options include: beige (shown), brown, peach, pink, or gray. Also tell me your glove size: S, M, L, XL. If purchased separately, these items would cost $104. 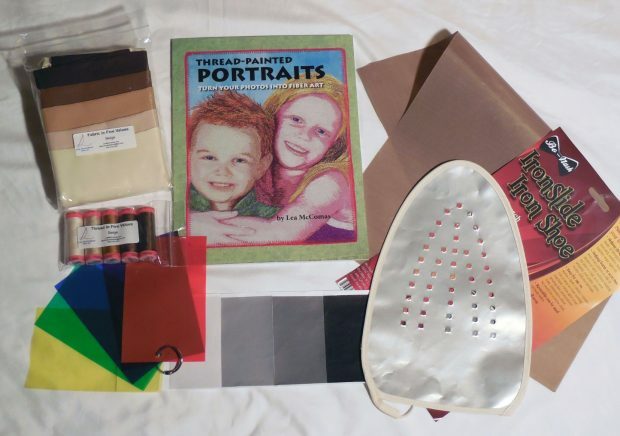 When you are ready to tackle it all: applique and thread-painted portraits, this is your kit. It includes book, fabric kit, thread kit, Pressing Mat, Iron Shoe, Supreme Slider, GrabARoo’s gloves, and Value Finding Tool kit. When ordering, look for a memo to seller box on the Paypal website. Indicate color preference in this memo box. Your options include: beige (shown), brown, peach, pink, or gray. If purchased separately, these items would cost $134.